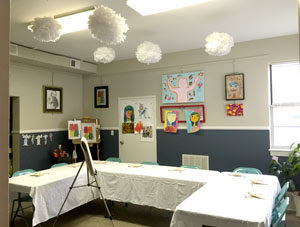 This past weekend, we had the pleasure of celebrating K Art's 14th anniversary and hosting our first Art Jam birthday party at the studio for a very special 10 year old. It was a perfect way to recognize both milestones. While our business remains focused on graphic design, the art classes that we offer have grown into a wonderful creative exchange. We pass along experience and encouragement to our students, and we gain so much inspiration from the aspiring artists of all ages who take our classes. Thank you sincerely for your continued support of our business and endeavors! Art Jam is our new arts education program offered through Culpeper County's Parks & Recreation Department. We started the year with Mr. Tony's Superhero Drawing, Kelly's Bold Color Painting, and Cole's Fish Prints classes for kids. In June, we're coordinating Kaleidoscope (formerly Windmore's Art in the Park) summer art camp and combining forces with local artists and educators to bring memorable art experiences to local kids. In July, we're offering Art Jam for adults! Why should kids have all the camp fun? Drop in for a day or spend the week exploring the arts and celebrating your creativity. For all of our classes and camps, pre-registration is required.To register, check out the county's web site. Winner will be randomly selected on September 27, and announced in our e-newsletter on September 28. We are very excited to announce that we have relaunched K Boutique, an online store and creative outlet. The shop has been re-designed, re-imagined, and completely re-stored. Big thanks to our friends at BuzzCart for providing a powerful e-commerce solution. Hardworking graphic designers need to unwind, but creative minds need to keep making stuff, and K Boutique is the result. Our graphic design training at Rochester Institute of Technology (RIT) began with a year of fine art foundations in drawing, painting, sculpting, and art history, and our creative process still rests on this base. It may say “graphic designer” on our business cards, but we’re still artists too. Our other contributors to K Boutique are our kids, Cole and Joy, who genetically share our compulsion to make stuff. Collaborative projects are a fun way for us to play and learn together. All of our products are made by us, and some are completely customized. Nothing is mass-produced or imported. If you are looking for a unique gift or a little something for yourself, check it out at www.k-boutique.com. 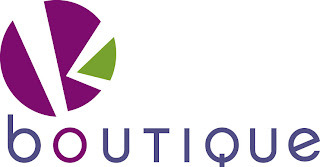 We hope you enjoy K Boutique and that it supplies a creative spark for you too! 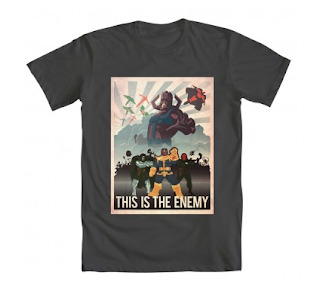 Tony was awarded an honorable mention in the latest Marvel-related t-shirt and poster design contest at welovefine.com. Tony's design, "This is the Enemy" includes 25 Marvel villains and a nod to propaganda posters. It is now available for purchase as a t-shirt or poster print. To celebrate, we are giving away a poster! To enter, "like" our Facebook page and post where you would hang the poster if you were to win. Contest closes September 21st, and a winner will be selected randomly from the entries. You can only enter once; however, especially creative posts will be awarded a second entry at the judge's discretion. A Folly is a handmade felt doll and a child's drawing brought to life. 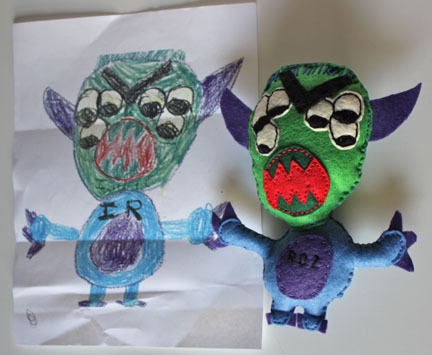 Kelly began making these dolls during the Green Bay Packers postseason run in 2011 as a way to entertain the kids while the games were on. Fun to make and even more fun to play with, Kelly is now taking orders. Check out our Folly gallery on our Facebook page! For more information, click here. We will be closed on Wednesday, July 4 to celebrate the red, white, and blue. 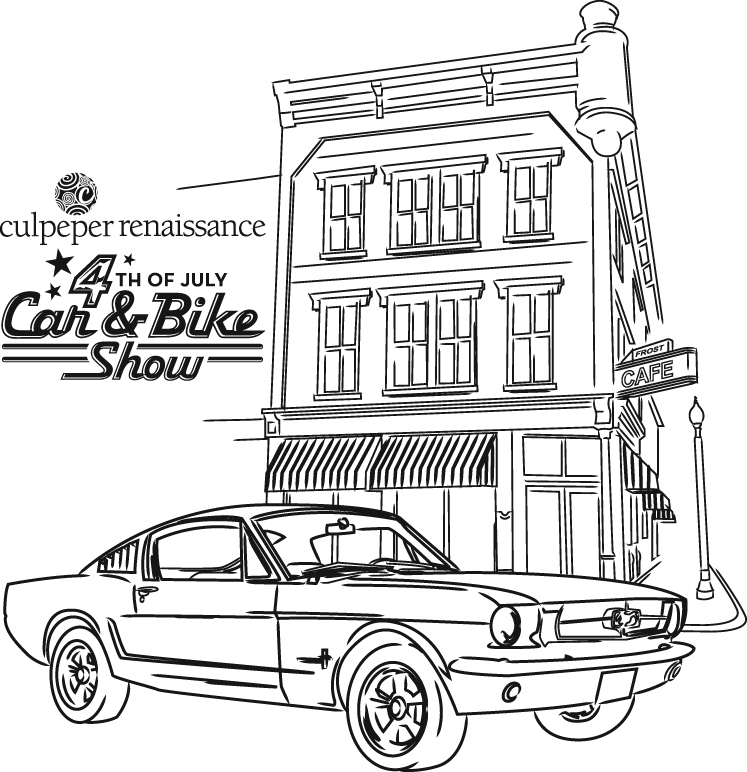 Culpeper has a great downtown celebration including a parade, a car show, and of course, fireworks. 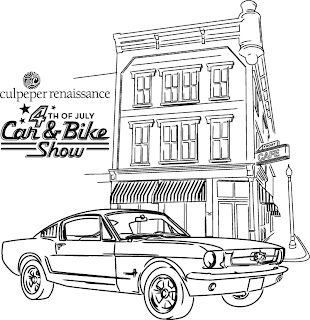 Recently, Tony designed a commemorative T-shirt for Culpeper Renaissance Inc. (CRI)'s Car & Bike show. This year's show features classic mustangs.